A few months ago I received a review copy of Maria Hunt‘s new book The Bubbly Bar . 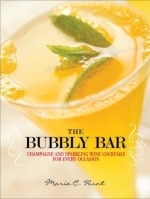 Unlike most cocktail books, this one centers entirely on Champagne based cocktails. The book starts, as it should, with the classics. Some I’ve featured already (eg The Champagne Cocktail and the French 75) and some I have not (look for the Bellini and the Kir Royale later this week). After the classics are laid down Maria goes on to cover more recent creations. Amongst these are riffs on other cocktails (like the Aperol Flip and Ruby Red Sangria) and original cocktail creations (like the Violet Fizz, which I’m going to mix up later this week, and the Cucumber Cooler which I’ve listed below). The recipes are straight forward, using fairly common ingredients for the most part. Another definite high point is that Maria put some effort in to making the drinks balanced. Which, in a world where a lot of restaurant creations are much too sweet, is very welcome. In addition to the well thought out recipes, the photographs are also quite stunning. Overall, the book is well done and worth checking out if you’re looking for some new ways to enjoy an old classic.